Tariq ibn Ziyad - or better still, Tariq - is probably the one and only Moorish military man of antiquity who has actually became a household name in Gibraltar. 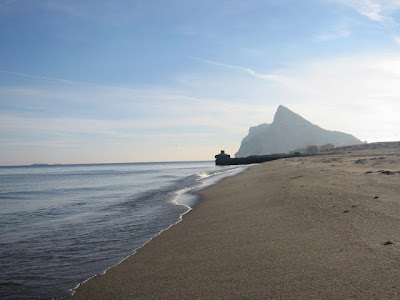 His fame is two-fold - he is supposed to have started the entire conquest of Spain when he landed his troops in Gibraltar and he gave the Rock its name - Jebal Tariq - (see LINK) meaning the Mountain of Tariq. As regards actually landing in Gibraltar, the question is . . . did he? The person perhaps most responsible for casting doubt as to whether Tariq did indeed ever set foot on Gibraltar at all was the British historian George Hills in his book The Rock of Contention.
. . . had Tarik building an 'al-hisn', a fort, crowning the promontory. 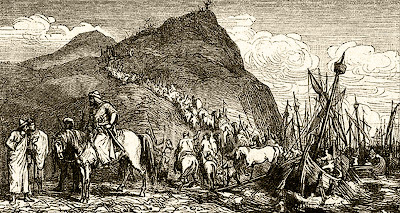 This he wrote was only for temporary use and after he had captured the area of Algeciras he abandoned it.
. . . the mount of conquest is the citadel of Islam . . from it began the great conquest and at it disembarked Tarik ibn Ziyad . .
Tarik landed at the foot of the Mountain that afterwards received his name. Against this Hills offers the argument that the concept of Gibraltar as a geographical entity divorced from its hinterland only dates from the 1713 Treaty of Utrecht. (see LINK) In any case the geography of the area coupled with the military requirements of the operation should make be enough to have one doubt the descriptions offered by these authors. He thought ibn Tufail, a 12 century writer, philosopher and novelist known as Abu Jaafar ibn Abd l Hakk and by a confusingly large number of different names, offered a better analysis of what happened. Tarik . . . cast anchor close to a mountain which received his name, attempting to a land on a commodious part of the coast where he had intended to disembark but meeting with resistance from Christians, giving up that spot sailed from it by night, and went to another part of the coast . . and in this way managed to effect a landing unobserved by his enemies and before they were aware of it. And perhaps an even more interesting account by the Egyptian Muslim historian Ibn Abd-el-Hakem or Al-Hakam. And there was between the two majaz ( paths or landing places ) a mountain in Spain which is today called Djabel Tarik between Septa and Spain. When it was evening Ilyan ( Julian ) brought him the ships and carried them to him to that majaz where he lay in hiding during the daytime; and when evening came , he returned with the ships to the rest of his comrades who were carried to the majaz until none remained so that the people of Spain would not take notice of them and did not think the ships other than those which plied across the straits for their benefit since they in no way seemed different from them. The point made by Hills is that Gibraltar was not the place where they disembarked but was just a place that lay between the points of departure, Ceuta, and that of arrival in Spain. To cut a long story short Hills suggest that they first tried Carteia, found resistance and then moved over to the eastern side of the Rock where they landed somewhere close to Punta Mala near where La Atunara is today. Hills probably based all this reasoning on a single source, that of Ibn al Qutiya - or al Qutiyya - a writer of the 10th century. When Tarik crossed over from Africa to Spain the place he conquered was Carteia, which is under the jurisdiction of Algeciras. If Hills is right, then Tariq probably never set foot on Gibraltar. The next two main 20th century general histories of Gibraltar written by William Jackson in 1987 and by Maurice Harvey in 2000 both tend to agree. Jackson is of the opinion that the Arab chronicles' account of the landings, 'is obscure and muddled' and suggests an attempt near Carteia then a trial near the Red Sands beach in Gibraltar and then off to Punta Mala which is near La Atunara and is not to be confused with the place with the same name on the Bay of Gibraltar. Jackson is even more abrupt. There is, he writes, no clear evidence of where Tariq actually disembarked and suggests that 'the most likely conclusion is that Tariq sailed round the Rock to the east and landed somewhere east of the isthmus. The only real dissenting voice comes from local historian Tito Benady who is less inclined to dismiss Arab chronicles as either obscure or muddled and marshals his own evidence accordingly. In fact there is a touch of annoyance in Benady's reference to Hills' conclusions. Un autor reciente (Hills) trató de demonstrar por razones que no están muy claras, que Tariq no desembarcó en el peñón y por eso es interesante estudiar las fuentes que tenemos . . . . Acknowledging that most of the chronicles written by Moorish commentators have either been lost or fragmented he nevertheless offers a series of quotes to bolster his counter arguments. The first is taken from the so-called Ajbar Machmua, a manuscript written by an anonymous 11th century writer. Y Musa nombró . . . a Tarik ibn Ziyed . . . para que fuese a España con 7000 muslimes . . . en los cuatro barcos mencionados, únicos que tenían, los cuales fueron y vinieron con infantería y caballería, que se iba reuniendo en un monte muy fuerte, situado a la orilla del mar . . . . In other words, he landed his troops in Gibraltar. Another possible early source might have been the 11th century Ibn Hayyan although his chronicle of the conquest of Spain has disappeared. Like Hills, Benady quotes Al-Makkari as he is known to have used Ibn Hayyan's material. Habiendo completado sus preparaciones, una división del ejercito cruzó el mar que separaba Andalus de África y desembarcó Tariq al pie de la montaña que después recibió su nombre. Cuando Tarik iba a desembarcar en una parte espaciosa de la costa encontró algunos de los Rum que se resistían. Pero Tarik desistió y se fue a otra parte de la costa y allanó ( las rocas de la orilla) con sus remos, sobre las cuales colocó las monturas de su caballos . . . .
Benady then quotes Ibn Qutaybah - or Koteybah, a 9th century Persian scholar - as translated by Pascual de Gayangos in his History of the Mohammedan Dynasties. When Tudimir (Murcia) heard of the landing of Tarik and his followers, he wrote immediately to Ludherik (Roderic) . . .
. . . después de entrar in las llanuras, conquistó Algeciras y otros sitios, y abandonó el fuerte ( hisn ) que estaba en las alturas del monte. A new source is Ibn Idhari al Marraakushi, 14th century author of a history of the Maghreb and Spain. 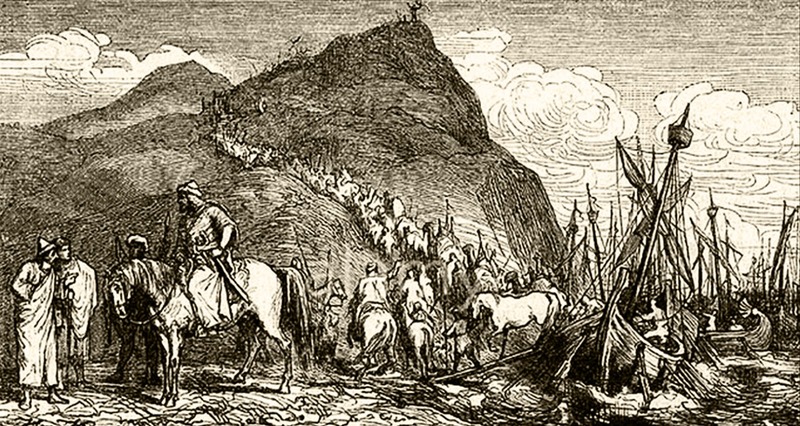 Cuando los musulmanes, árabes y bereberes cruzaron el estrecho y desembarcaron en el puerto, trataron de subir el acantilado del monte. Para facilitar la subida a sus animales de carga, allanaron el paso con alabardas, y cabalgando sobre ellas llegaron a la cima del monte. Allí levantaron una muralla para protegerse, que es conocida por el nombre del 'Muro de los Árabes. The existence of this wall is confirmed by another source. Se ven aun los restos de la muralla que ese capitán y sus compañeros allí construyen, y que son llamados el Muro de los Árabes. Los he visto durante mi estancia en esa plaza, en la época del sitio de Algeciras por los cristianos. Yet another source is Mohammad Ibn al-Idrisi the 12th century cartographer who created the celebrated map of the world known as the Tabula Rogeriana. Benady quotes him as mentioning a place called The Port of the Tree - Mersa Asajarah. Desde esta montaña a Algeciras hay seis millas; está aislada y es redonda s base; del lado del mar existen extensas cuevas por las que corren fuentes de agua, y cerca de allí hay un pequeño puerto denominado puerto del Árbol (Mersa Asajarah). Finally, Benady's interprets Al-Hakam - the same 9th century source used by Hills - in a totally different way. En la zona del estrecho se levantaba un peñón llamado hoy Yabal Tariq entre Ceuta y España. Al llegar la noche, Julián le hizo (a Tariq) pasar en sus naves, ocultándose los soldados por la costa española durante el día. Por la noche, las embarcaciones volvieron por los que quedaban y los transportaron hasta el último . . . Tariq pasó con el ultimo destacamento, uniéndose a los suyos. Benady claims that this proves quite clearly that Gibraltar was the first place where Tariq landed. I (Julian) will bring you to Andalus. But there was a mountain called the mountain of Tarik between the two landing places, that is between Septa and Andalus. When the evening came, Ilyan (Julian) brought him the vessels in which he made him embark for that landing place, where he concealed himself during the day, and in the evening sent back the vessels to bring over the rest of his companions. So they embarked for the landing place, none of them being left behind; whereas the people of Andalus did not observe them . . . Finally a quote from Historia de al-Andalus by Ibn al-Kardabus who was a 12th, early 13th century historian from Tunisia. Tariq encontró a algunos cristianos apostados en un lugar bajo [de la costa] en el que habían decidido el desembarco a tierra firme, pero ellos se lo impidieron. El, entonces, se aparto de allí durante la noche hacia un lugar abrupto. que él allanó con los remos y las albardas de las monturas; de él descendió al campo abierto, mientras ellos [los cristianos] no lo sabían. In other words the original decision had been to land somewhere near Algeciras but this proved impossible. The word 'abrupto' can, of course, be interpreted in different ways. Hard to say who is correct but I suspect that Hills version is just slightly more believable. But only just. 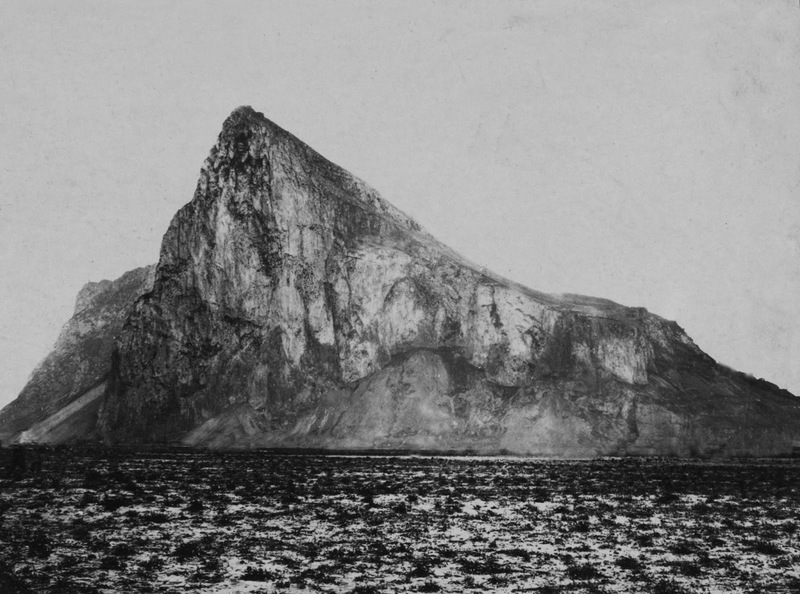 In any case as the American writer and educationalist Henry Coppée wrote in 1881, (see LINK) many attempts have been made by many to determine the exact spot of Tarik's landing but without much success. A puzzling problem . . . but fortunately it's a thoroughly unimportant one. Unless you are a Gibraltarian, of course, and feel that he should have landed on the Rock that bears his name.